This article discusses the potential of the Digital Storytelling method to enhance access to ICT and digital media in a developing country context. 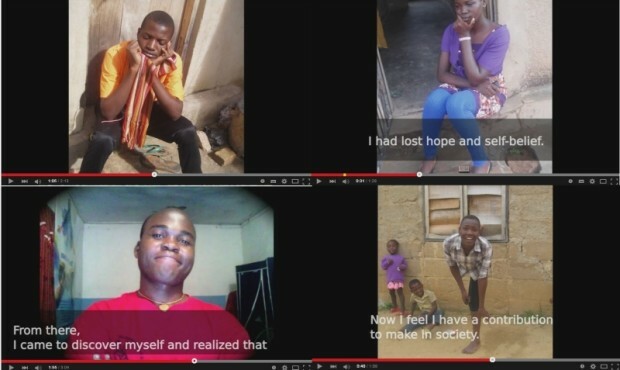 It presents a case study from Iringa, Tanzania, where a group of young adults with little prior experience on digital technologies created their autobiographical digital stories in a supervised workshop. The article argues that Digital Storytelling develops technical and creative skills related to digital media, and offers an empowering experience for the participants. Increased self-efficacy, combined with the experience of communicating and connecting to other people through the digital stories, provides motivation for continued digital participation. Thus, even though Digital Storytelling workshops are usually short-term interventions, they may have long-term impacts for the individuals involved. It has been widely recognized that new information and communication technologies (ICTs) provide new opportunities for civic participation, and when used effectively, contribute positively to social capital and social inclusion of individuals as well as to socio-economic development of societies (e.g. Helsper and Eynon 2013; Katz and Rice 2002; Mossberger, Tolbert and McNeal 2008). Moreover, new digital media tools and online platforms have enabled and empowered ordinary citizens to produce and disseminate media contents, thereby changing the traditional relationship between professional media producers and media consumers. These media contents and production practices – including Digital Storytelling – have been varyingly conceptualized as user-generated or user-created content, as community media, grassroots media, participatory media, amateur media or citizen media. Besides great hopes and optimism, however, there are also concerns over inequalities in access to and use of new technologies. Since 1990s, the concept of digital divide has been employed to describe these gaps. Initially digital divide referred to inequalities in physical access to computers and Internet, but in more recent digital divide research, the attention has been increasingly shifted to differences in skills anduses of new technologies (e.g. DiMaggio and Hargettai 2001; Helsper and Eynon 2013; van Deursen and van Dijk 2010, 2014). The concept of digital divide itself has been criticized and called into question by some scholars, who have suggested it implies a too simplistic idea of a bipolar division between “the haves” and “the have-nots” and puts too much emphasis on technology, disregarding the complex social, economic, political and cultural factors involved (e.g Warschauer 2003). Digital inequalities exist between individuals and groups of people within countries and between countries and regions. The big ”global digital divide” continues to exist between the developed countries of the global North and the developing countries of the global South. It appears that while the general trend has been for the gaps in ICT access to be closing, the digital divide between the least developed countries and the rest of the world has continued to widen (e.g. Sciadas 2005; Skaletsky, Soremekun and Galliers 2014). This is the case especially with African countries, most of which had not achieved any major improvements in digital development and ICT access until recently (Olatokun 2008; Skaletsky et al. 2014). However, the situation may be changing gradually, at least in terms of physical access to Internet. Sub-Saharan Africa, which is the region with the lowest Internet penetration in the world, currently has the biggest growth rate in the Internet use (Internet Society 2014, 22). Poor access to ICT in developing countries is only partially caused by underdeveloped ICT infrastructure. There are several other barriers involved, such as poverty, limited education and literacy, limited language skills, and limited presence of culturally relevant online contents in local languages (e.g. Olatokun 2008; Warschauer 2004, 58–59). As decreased prices of Internet services and diffusion of smart phones and mobile broadband connections are making Internet more available and affordable to citizens in developing countries, digital skills are becoming a more and more decisive factor in digital participation. 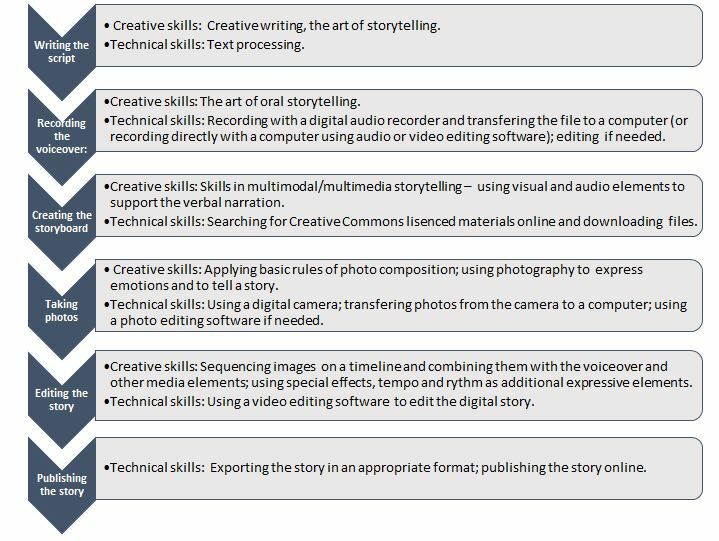 What skills relevant for access to ICT and digital media are developed during the Digital Storytelling process? What does building new skills mean to the workshop participants themselves? How can digital stories serve as a means of communication and digital participation? How can Digital Storytelling experience provide the motivation for continued use of digital tools and participation in digital environments? The second research question is most directly linked to the Tanzanian case study, and a descriptive analysis of group interviews of the workshop participants is the key to answering it. The other research questions are somewhat more general in nature, and even though the workshop experiment provides a starting point for the analyses, answering these questions requires a higher level of interpretation and abstraction by the researcher. Before introducing the case study and discussing the methodological and ethical issues related to it, I will briefly introduce the Digital Storytelling method and outline the theoretical and conceptual framework relevant for this article, focusing especially on the constituting elements of ICT and digital media access. The classic model of Digital Storytelling originates from Berkley, California, where Joe Lambert and his partners started developing the method in early 1990’s and founded the Centre for Digital Storytelling (CDS) in 1994. Since then, CDS has held countless workshops for storytellers and trained people from around the world to become DST trainers and facilitators. (See Lambert 2009a, 1–10; Lambert 2009c.) This specific Digital Storytelling model is sometimes denoted by the use of capital D and S, to separate it from the general meaning of the word as any multimedia narratives and storytelling conducted with digital technology. As a practice, Digital Storytelling is essentially a facilitated group process (Lambert 2009b, 25). In supervised workshops, participants create their own, autobiographical stories, making use of digital media tools. These stories are shared to other workshop participants and in many cases also published online. For workshop participants, the process of developing and sharing their stories within the supportive and safe environment provided by the group of participants and facilitators is often just as important as the actual final product, the digital story (Hill 2004, 1; Meadows and Kidd 2009, 106–107). As a form of media, digital stories are short multimodal multimedia narratives. They are created as a combination of photos or other images, a voice-over with the first-person narrative of the storyteller, a soundtrack with music or other sounds, and text. The final product is a short video, typically only a few minutes long. Digital Storytelling is a relatively low-threshold method in the sense that it does not require professional media skills nor expensive professional equipment. Digital stories can be produced using whatever technology is available in the local context: pictures can be taken with mobile phones, tablets or digital cameras, and the story can be edited using free photo, audio and video editing applications on mobile phones, tablets, laptops or desktop computers. Digital Storytelling can be used for various purposes, such as reflecting on one’s cultural identity, recording and sharing a community’s cultural heritage, creating interaction between generations, civic activism, social marketing, community development, urban planning, developing future scenarios, or professional reflection and development (see Lambert 2009a, 91–104). In the context of educational institutions, Digital Storytelling is commonly used for developing various literacies and building practical skills in multimedia production (McWilliam 2009, 39–53). Along with its growing popularity, Digital Storytelling has become the subject of a growing body of academic research in various fields and disciplines, such as education, literature, arts, technology, health sciences, and media and communication studies. Academic contributions have been mostly theoretical discussions or case studies with diverse perspectives. In several studies, Digital Storytelling has been conceptualized as a self-representational practice (e.g. Brushwood Rose 2009; Herzberg Kaare and Lundby 2008; Nelson and Hull 2008; Thumim 2008, 2009) and as a resource for constructing, expressing and reflecting on one’s identity (e.g. Davis 2005; Nyboe and Drotner 2008). DST has been analysed as as a participatory media practice that has democratic potential (e.g. Burgess 2006; Carpentier 2009; Couldry 2008). Some scholars have focused on the organizational settings and practices of DST workshops and projects, and the competences and tools required to carry them out (e.g. Lundby 2009; Dush 2009). In health sciences, researchers have presented optimistic accounts of the method’s potential in health promotion (e.g. Guse et al. 2013; Gubrium 2009), and DST has been also found to be a promising tool for community and youth development (e.g. Clarke 2009; Hill and Reed 2009; Wexler et al. 2013). For this study, research papers dealing with the skills developed through DST are most relevant. Several researchers have concluded that Digital Storytelling is an effective pedagogical tool and instructional technology. It develops multiple literacies and skills, such as technical skills, creative skills, oral and written communication skills, collaborative skills, and skills in conceptual and critical thinking, and in addition enhances learning of instructional, subject-related contents in formal education (e.g. Czarnecki 2009; Gregory and Steelman 2008; Li 2007; Niemi et al. 2014; Robin 2008; Smeda et al. 2014; Sylvester and Greenidge 2009). When discussing digital divides, the focus is usually on access to ICT, and even more specifically, on access to Internet. In this article, however, I am interested in inequalities in access to new digital technologies, platforms and contents more broadly. From the perspective of Digital Storytelling, access to ICT and access to digital media are both relevant, and the challenges related to them are very much parallel. Especially at the early stages of digital divide research, access to new technologies was often understood in a narrow sense as ownership of devices and as availability and affordability of Internet services. These technology-oriented conceptualizations of digital divide and access have been later criticized and alternative conceptualizations have been put forth which recognize the importance of social aspects of access, such as awareness, usage, motivation, social support, and ICT and digital media skills (e.g. DiMaggio and Hargettai 2001; Katz and Rice 2002; Van Dijk 2005; Warschauer 2003, 2004). As DiMaggio and Hargettai (2001, 4) put it, once the Internet penetration increases, the most important issue has to do with ”what are people doing, and what are they able to do, when they go on-line”. In his conceptualization of ICT access, Mark Warschauer (2004, 31–48) emphasizes social embeddedness of technology and draws a parallel to traditional text-based literacy. For Warschauer, ICT access is a complex issue, and using ICTs is essentially a social practice. Having the required skills and an understanding of meaningful ways of using ICTs and digital contents is just as important as is having a computer and being connected to Internet. Warschauer (2004, 2003) points out, that to enable people to fully benefit from new technologies, a broad set of resources is required, including physical resources, digital resources, human resources, and social resources. Warschauers’s model (Warschauer 2004), when extended to include digital media provides a useful conceptual framework for analyzing the potential of Digital Storytelling to enhance digital participation (see Figure 1). Physical resources refer to the computer or other devices used to access Internet and to the actual Internet connections. In case of Digital Storytelling, devices include also the various digital media tools used for digital media production, such as digital cameras,digital audio recorders, and photo, audio and video editing software. Human resources encompass digital skills required to use ICT effectively, to broader literacies, and to education which supports achievement of these literacies and skills. In addition to computer and Internet skills, Digital Storytelling requires and develops media skills and more specific multimedia skills. Digital resources refer to digital materials made available online. Relevant and culturally appropriate digital contents in local languages are an important part of ICT access, since they provide an incentive for digital engagement. In case of Digital Storytelling, digital participation does not mean only making use of available digital materials, but also participating in producing new digital media contents. Finally, social resources include various forms of social support – community support, institutional support, and social structures which support access to ICT. In case of Digital Storytelling, the focus is primarily on the support provided by the local community – such as community organizations hosting Digital Storytelling workshops – and the DST workshop itself. Figure 1. 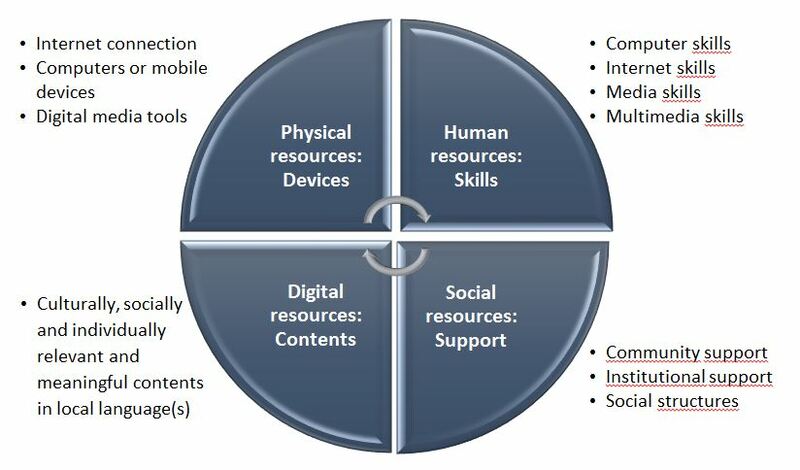 Elements of access to ICT and digital media (modified from Warschauer’s (2004) model of ICT access). Tanzania and other Sub-Saharan African countries are facing several challenges related to the above mentioned four elements of access. Issues related to the ICT infrastructure and ICT policies in Africa, as well as social and economic structures and policies which may either facilitate or hinder digital development, are complex and out of the scope of this article (for discussion on these, see e.g. Etta and Elder (eds.) 2005; Gyamfi 2005; Oltakokun 2008; Skaletsky et al. 2014). In the following analyses of the Tanzanian case study, I will focus on the micro-level of individuals and local community. I will discuss the digital skills and contents developed during a Digital Storytelling workshop and analyse their importance for motivation and meaningful digital participation. I will come back to the four elements of access in the concluding section of this article. The empirical analyses of this article is based on a Digital Storytelling workshop experiment carried out in April and May 2014 in a small town called Iringa, situated in the Southern Highlands of Tanzania. The workshop was planned and organized in close cooperation with a non-profit initiative RLabs Iringa. It was targeted at young adults who participated in the GROW Leadership Academy (GLA) training programme of RLabs Iringa[i]. A total of 13 young adults participated in the GLA training and the Digital Storytelling workshop, seven of whom were women. They were 18–25 years of age. Providing GLA students with new skills in photography, multimedia storytelling and video editing. Providing an opportunity for self-reflection, as students were asked to focus in their digital story on the change in themselves and their lives during the GLA process. Providing documentation of the first GLA training in RLabs Iringa and relevant material for impact evaluation. The author of this article was the principal trainer/facilitator in the said Digital Storytelling workshop. RLabs Iringa’s facilitators – local facilitators and two Finnish volunteers – were actively involved in the workshop, and additionally three Finnish journalism exchange students participated as assistant trainers and facilitators. Presence of several facilitators is vital for the success of a Digital Storytelling workshop, especially when participants have little or no experience of computers and other digital media tools needed to produce digital stories. Since most participants were not fluent in English, we used RLabs Iringa’s local facilitators – and occasionally workshop participants with good English skills – as interpreters in the workshop sessions. The DST workshop consisted of seven meetings totaling to 30 hours[ii]. The workshop was held in RLabs Iringa’s facilities. We used the second-hand laptops and digital cameras received by RLabs Iringa as donations from Finland, and used free software[iii] for video editing. Through short presentations with concrete examples and practical exercises, the participants were introduced to the basics of digital photography, written and digital storytelling, and video editing. As the main activity of the workshop, each participant created their own autobiographical digital story to be published online. The participants were instructed to create a two minutes long story about the change in themselves and their lives during the GLA training programme. In the end of the five week period during which the workshop sessions were held, the whole group watched together the digital stories created by participants. In another article (Juppi 2015), I have described the implementation of the workshop in details, including the topics and learning activities of each session. Methodologically this study represents action research approach. Action research is essentially a practice- and action-oriented approach, based on a deep involvement of the researcher and active participation of the target community. AR aims at local problem solving and changes through an intervention. Nonetheless, reflection on the action carried out in the field is an important part of the process, and that is where research methods come in. (E.g. Heikkinen and Jyrkämä 1999; Levin 2012). In this study, the research data was collected during the DST workshop by means of participant observation and group interviews, and the digital stories produced during the workshop served as additional material for analyses. In the Tanzanian case, the intervention was the DST workshop organized at RLabs Iringa, and the change pursued was improvement of digital media skills of the GLA students, on one hand, and their empowerment through the experience of creating and sharing their stories, and reflecting on the positive changes in their lives during the GLA training, on the other. The activities implemented at RLabs Iringa were primarily designed for this purpose, and knowledge generation through research activities was a subsidiary to action. The main research interest was to document, reflect on and disseminate experiences of using the Digital Storytelling method in a developing country context. Action research approach means that a researcher has a dual role in the process. An action researcher faces the challenge of having to be able to sift between perspectives: that of a researcher and that of an involved actor. Morten Levin (2012, 133) expresses this tension eloquently with the metaphor of the ”Janus face”, where ”One face views the incredible strength of having lived the field through involvement in a continuous and long-term ongoing change activity, while the mirrored face attends the striving for reflective distance and rigorous analyses that is challenged through emphatic and political involvement”. My involvement in the field has not been limited to this specific Tanzanian workshop. As a media and higher education professional, I have facilitated also other Digital Storytelling workshops, and trained professionals and higher education students in various fields to use the method as a professional tool. Therefore, it is fair to say, that I am involved in the Digital Storytelling movement. I recognize the challenge of changing my perspective from a practicing professional to a reflective and critical researcher, and have done my best not to let my involvement and attachment to the DST method and movement to bias my analyses and interpretations as a researcher. In the Tanzanian case, my dual role and perspective meant that I was both the main trainer/facilitator of the workshop and the researcher. During the workshop, I was able to observe participants and their activities and those observations were recorded as field notes after each session. However, as I was much of the time engaged in assisting participants with making their stories, it would have been impossible to notice everything that was simultaneously going on in the workshop sessions. In that sense, a researcher who would not participate in the actual workshop activities might be in a better position to make and record systematic observations. Having short informal debriefings with other facilitators to exchange ideas and observations after each session helped me to get the whole picture of what was going on in our sessions. In the end of the Digital Storytelling workshop, two group interviews were conducted to collect qualitative data for this study. The focus of interviews was on the experiences and feelings of the participants of the process of creating their own digital story, of sharing it with others, and seeing other students’ stories. The participants were divided into two groups of six and seven participants. A moderator – the author of this article in one group, another workshop facilitator in the other group – facilitated the discussion by asking questions and encouraging each participant to contribute. The form of the group interviews was semi-structured, with a list of topics to be covered and suggestions for questions on each topic. RLabs Iringa’s local facilitators acted as interpreters in the group interviews, translating moderators’ questions in Swahili and participants’ answers in English. This inevitably affected the dynamics in the groups: there was very little interaction among the participants and they mostly replied one at a time to the questions asked by the moderator. For this reason the data from these group discussions is not as rich as it might have been if everyone had communicated in Swahili, without the necessary interruptions by the interpreter. However, in spite of the shortcomings, the group interviews still provided valuable insights into the experiences of the workshop participants. The group interviews were recorded with digital audio recorders and then partly transcribed (the English language parts). The transcribed material was coded and organized into thematic categories. In this article, the main focus is on the themes of new skills as perceived by the participants, on the continuation of DST activity, and on communication and connection through digital stories. Before the group interviews, the workshop participants were informed that interviews would be recorded and used as material for a study on their Digital Storytelling workshop. They were told that participation was voluntary and the participants of the group interviews would remain anonymous, i.e. any quotes or references to their comments would be anonymous. The audio recordings of interviews were anonymous. However, the fact that the digital stories made by participants were published online, means that anonymity in this case is only partial. Through the digital stories, it is possible to identify the participants of the workshop and therefore participants of this study, even if they cannot be connected to any specific interview comments quoted. This could be an ethical problem if the study at hand would deal with sensitive issues and/or could be somehow harmful to the participants. I do not believe that is the case in this study. Some of the digital stories created in the workshop, however, dealt with more personal and sensitive issues than this study. In the beginning of the workshop, the participants were informed that publishing their story online was voluntary, and they could make the decision once their story was completed. In the end, every participant wanted to have their story published. Digital storytelling can be a very effective way of developing 21st century digital media skills – even when it is not the explicit purpose or a workshop. The process of creating one’s own digital story requires and develops several creative and technical skills related to ICT and digital media tools (see Figure 2). What makes Digital Storytelling an especially useful approach to skill-building is that at the heart of the process is creating one’s personal digital story – not the tools and techniques per se. As Warschauer (2004, 124–125) points out, the best way to develop the multiple literacies required in the information age and to benefit from ICT, is to use them for tackling real problems and for engaging in new communities, instead of focusing on computers and Internet as the main focus of learning. According to Warschauer, the latter approach – typical of traditional computer education – tends to lead to adoption of most basic kinds of technical skills. The traditional approach can also be less motivating for students (e.g. Robin 2008). Figure 2. The production process of digital stories and the skills involved at different stages. The exact production process followed, and the related skill set developed during a Digital Storytelling workshop depends on the specific, contextualized implementation of the workshop. In our workshop, students did not write their scripts with a computer, because writing their story was a home assignment and hardly any of the participants had access to computers at home. Since the stories were written and recorded in Swahili language, and we wanted also non-Swahili speakers to understand them, adding English subtitles (translated by local facilitators) added an extra task to the work process. Writing the stories in Swahili also meant that the Finnish workshop facilitators were not able comment the written scripts before they were recorded. Having feedback from facilitators and developing and revising one’s text based on that usually leads to a better narrative. In workshops organized in developed countries, participants often use previously taken photos as material for their story. In case of the DST workshop in Iringa, taking new photos for the digital stories was a significant part of the work process. We knew that the participating GLA students would not have many images readily available for their stories. Since it was vital that the authors of the digital stories, being the protagonists of their own stories, would be shown in some of the photos, we instructed the participants to partner up with a fellow student when taking photos for their stories. During the various stages of the production process, the participants of our workshop mostly did various tasks by themselves, supervised and assisted by the workshop facilitators. Recording the voice-over was done together with facilitators, using a digital audio recorder. Due to the limited time available, voice-overs were edited only if necessary, and audio editing was done by one of the facilitators. The same applied to photography: photos were not edited, unless it was necessary (e.g. to rotate a vertical photo). Therefore the completed digital stories were not as polished as they could have been if more time was available or workshop organizers would have used a professional post-production team to finalize the stories. Publishing the completed digital stories online, on a YouTube channel of RLabs Iringa, was done by RLabs Iringa’s facilitators after the workshop was finished. Based on the observations during the workshop and on the completed digital stories, we can conclude that all the participants developed new creative and technical skills related to digital media. However, since some of the participants needed much assistance during the production process, they would probably not be able to produce another story independently, without someone to assist with video editing software. To realize just how remarkable an achievement creating their own two minutes long digital story was to the workshop participants, it is important to understand their backgrounds. Most of them had for the first time started to learn computer skills and get familiar with the Internet and social media during the GLA training programme, which had continued for four months when we started the DST workshop. Therefore their ICT skills were still very elementary when we started to work on the digital stories. Some participants adopted new devices, software and techniques very fast and worked very independently, others needed more support and encouragement to complete the assignment. We did not use any formal skill test to measure the skill levels of the participants. Skill test approach would not fit well with the philosophy of Digital Storytelling, with its emphasis on valuing stories and creativity of ordinary people and empowering them to participate in digital media production. Instead of testing skills, we were interested in the subjective experiences of the participants themselves – how did they perceive their new skills and what did the new skills mean to them. During the group interviews, the participants repeatedly brought out the new skills they had developed during the process – even when we would ask about something else such how they felt about creating their own story or seeing their own story on a screen. Learning new skills was clearly something they valued a lot and were excited about. Having new digital media skills made the participants feel very optimistic about their future prospects. Several participants expressed that it had not occurred to them before that they, too, could do something like this. They had thought producing videos was something only other people, such as media professionals, did. Realizing that they could themselves be a part of creating digital media contents was an empowering revelation. Audiovisual and digital culture are not nearly as familiar to young Tanzanians as they are to the youth growing up in developed countries. Besides the limited access to Internet, also access to traditional media is limited and unequally distributed in Tanzania. Radio is the most accessible media, whereas having a TV set at home is still a luxury which the majority of people living in poverty cannot afford. Access to TV is most common in urban areas and among the highest income groups. Especially in rural Tanzania and among the lowest income groups, not having electricity at home is a common problem preventing access to media devices. (Murthy 2011, 9–11, 18.) Several of our workshop participants did not have TV at home, but they had had an opportunity to occasionally watch TV in other places. The process of producing audiovisual or multimedia contents was something new to the participants, and making their own small scale media production made them understand better what is involved in the process. Most participants had never used a digital camera and taken photos before, so we used the first workshop sessions to teach basics of photography and students got to practice taking photos with digital cameras. Some participants had taken pictures, but had never received any instruction on how to take good photos. They were happy to learn basic rules of photo composition, and felt it helped them not only to improve their photographic skills but also to ”understand why other people take certain kind of photos and why they are good”. In addition to learning new skills themselves, being able to pass the new skills on was an important experience for many participants. Several participants told us that they had asked someone from outside the GLA group to take photos of them for the story, and that they first had to teach those persons how to take good pictures. Even though the participants were not directly asked whether they were planning to make another digital story, almost all of them spontaneously stated during the group interview, that they wanted to continue with Digital Storytelling. They felt confident with their new set of skills and wanted to do something bigger and better, making use of and further developing those skills. ”So after this, I’m going to do something bigger”. ”The mistake I was about to do [in the beginning of the workshop] was, that I was thinking this is not for me, this is for some other people. So that was my challenge in the beginning. But now I have made it and I’m planning to do something greater than this”. Creating their digital stories, and developing new skills along the process, was clearly an empowering experience for the participants. The facilitators supported this on purpose by not critiquing the technical quality of the stories created, but rather focusing on their creative and expressive elements and showing appreciation of the personal narratives shared. Based on the group interviews, it seems clear that self-efficacy of the participants was very high in the end of the process. Self-efficacy (or perceived self-efficacy) refers to a person’s believes about their capability to complete given tasks and accomplish desired outcomes. People with high self-efficacy are not afraid of challenging tasks and goals, and they are motivated and committed to work for them. (E.g. Bandura 1994.) Even though self-efficacy does not necessarily reflect actual skills one possesses, but rather subjective experience of those skills, it is an important motivational factor and as such valuable in itself. Confidence in one’s skills may be as or more important than the actual skills for digital engagement, especially in case of more complex forms involving production of digital media contents (Helsper and Eynon 2013, 708). Therefore, for the continued digital participation of our Tanzanian workshop participants, it is important that they themselves believe they are capable of continuing to do digital stories or other digital media contents. Even though the process of creating stories is important in Digital Storytelling, so are the final products of the process, namely the digital stories.Digital Storytelling provides an opportunity to the workshop participants to create small scale digital media productions and thus become part of the creation of new digital contents online. Stories become a means to digital participation and dialogue. In the beginning of our workshop, the participants were informed that their digital stories would be shared among the workshop group, and with their permission, also published online. Therefore they were aware that they were not telling their story just for themselves, but also for others. This was evident in the narratives of the digital stories. The stories typically started with an introduction of the narrator, clearly targeted at an audience who would not know the storyteller. Many of the titles of the stories were addressed at ”you” – whomever would watch the story – and they provided encouraging maxims: ”Never Lose Hope”, ”Don’t Give up!”, ”If you Change, You can Become Successful”. Video 1. Imaculata’s story – an example of a digital story created in the Digital Storytelling workshop in Iringa. For more digital stories from the workshop, see RLabs Iringa’s YouTube channel. The communicative aspect of digital storytelling became evident also in the group interviews. When the participants talked about the digital stories they would want to do in the future, they were already thinking about the other people who would see their stories – how through their stories they would communicate to ”other people in the world”, even to ”future generations”. In the group interviews, we discussed how participants felt about sharing their stories to people they did not know. Students where happy to allow their stories to be published online, because they wanted ”others to see our changes”. The participants felt that their digital stories could serve as a window into their life and realities and help others to understand their situation. Participants of our workshop also felt that the stories they and their fellow GLA students created during the workshop could serve as an inspiration and as encouraging examples for other people, and said that they themselves had learned a great deal from watching their fellow students’ stories. Even if they had very little previous experience of audiovisual and multimedia contents, the participants had a very strong sense of the digital video format being more enduring, easier to share, and more appealing to other people than a story written on a paper and shared orally. Thus they rather intuitively recognized the power of these digital multimodal narratives in communicating to others across time and space. The experience of telling one’s story to other people is an important motivational factor. Creating a digital story to be shared among the workshop group, to be screened at a local community event and/or to be published for an online audience makes it a ”real thing”, not just an assignment for the sake of practicing new skills. Having one’s digital story published online, gives the storyteller a voice and gives them an opportunity to be heard, not just in their local community, but potentially also by people from other parts of the world. Together with self-efficacy, motivation is a key factor in determining whether digital storytellers continue to engage in digital story creation or other forms of digital participation. In this article I set out to discuss the potential of the Digital Storytelling method to enhance digital participation in a developing country context. Based on the Tanzanian case study discussed in the previous sections of this article, it seems safe to conclude that the supervised and facilitated process of creating digital stories can enhance access to ICT and digital media for the participants of a DST workshop. In the following, I will summarise and discuss the main findings related to the four research questions. 1) Building Skills in a Digital Storytelling workshop: The Digital Storytelling process develops several creative and technical skills required to use ICT and digital media in an effective and meaningful way. In case of the Digital Storytelling workshop for Grow Leadership Academy students, especially the participants’ skills in photography, storytelling (written and digital) and video-editing were developed at various stages of the process. However, there was not much engagement with online environments during the digital storytelling process, even though the final digital stories were published online. Therefore Internet skills of the students were not developed considerably by the DST process (unlike during other parts of the GLA programme). The exact skill set developed during a Digital Storytelling workshop depends on the locally contextualized implementation of the method. 2) Meaning of new skills to the workshop participants: Building new skills and using them to create one’s own digital story can be a very empowering experience for participants of a workshop, regardless of the actual, objective skill level reached. In the end of the workshop, GLA students were very excited and confident about their skills. New skills gave them new hope about their future prospects. Even though their own subjective perception of their skills might not accurately reflect the actual skills, high self-efficacy in itself is an important motivational factor. 3) Digital stories as a means of communication and digital participation: Digital stories made by participants of a DST workshop can be a powerful means of communicating and connecting to other people. Digital Storytelling is not only about creating stories, it is about sharing them. When the stories are published online, they can at least potentially reach a much wider global audience than if they are just screened in a local event. The GLA students felt good about the opportunity to share their encouraging messages to other people and to have other people relating to their realities. In a developing country context, storytellers can at the same time participate in producing much needed locally relevant online materials for local people in a local language, in this case in Swahili. Increasing presence of relevant digital resources can contribute to encouraging other Tanzanians and Africans to engage in digital environments. 4) Motivation for continued digital participation: Building news skills, believing in those skills (self-efficacy), and understanding the possibilities of using personal digital stories for communicating to other people locally and globally, all contribute to motivating participants to continue using digital media tools and engaging in digital environments. Nevertheless, given that creating a digital story is a rather challenging and time consuming process, and social support and devices will not necessarily be available to all the workshop participants after the GLA programme, it is likely that most of them will never create another digital story. This does not mean, however, that they will not use the new skills for digital participation also after the workshop. Many GLA students have been making use of their skills on a smaller scale. For example, learning the basic photography skills has encouraged several GLA students to continue taking self-portraits and other photographs and posting them on their Facebook profiles. This is one way of continuing to construct and share self-representations and narrate their own life story. One of the participants, a singer-songwriter, used his new skills after the workshop to create a simple music video for his own song. Some of the participants have actively continued to use their ICT and media skills and to pass them on by working as facilitators for a new group of GLA students. Digital Storytelling is of course not a miracle cure to unequal access to ICT and digital media. It has positive contributions to make, related to the different elements of access discussed earlier in this article (see Table 1). However, it has its limitations, many of which have to do with the fact that Digital Storytelling is a small scale activity, which lasts for a limited duration of time and reaches only some individuals or groups of people. Unless Digital Storytelling workshops are organized in an institutional setting, such as in collaboration with a local library, museum, community centre or non-profit organization that can continue to provide the devices and support needed to create digital stories also after the workshop, it can solve challenges with access to ICT and digital media only for a short period of time and only for a very limited number of people. In conclusion, Digital Storytelling workshops are usually short-term interventions, but they can have long-term impacts for digital participation of individuals involved, especially through skill and motivation building. Digital Storytelling process can help storytellers to find meaningful ways of using digital media tools and participating in digital environments. Moreover, if the digital stories produced in diverse workshops around the world are distributed online, the method can potentially have an impact on a much bigger group of people than the workshop participants. They can functions as means of communication and dialogue between different people in different parts of the world, and they can bring out the voices of ordinary people living in developing countries which are all too often missing from the mainstream media in the North and South alike. Digital media contents are still predominantly produced in developed countries, in English or other European languages. Digital stories can, for their small part, challenge this imbalance in digital contents available online. Physical resources: Devices Workshop organizers provide the devices (eg. computers, digital media tools, Internet connection) needed to create and publish digital stories. Physical resources are available only for a limited time, during the duration of the workshop, unless it takes place in an institutional setting that can continue to provide acces to devices. Digital resources: Contents Workshop participants create and publish online their own digital stories, and these contribute to building up locally relevant digital resources in local languages. Digital stories are typically subjective, autobiographical stories. They are valuable as such, but not sufficient alone. In addition, various reliable and relevant information resources are needed. Human resources: Skills DST workshop trainers provide basic training and supervise the working of the participants. Participants build a set of new ICT and digital media skills. The skill set developed during the workshop is mostly limited to applied technical and creative skills, at the expense of more complex literacies and analytical and critical competences included in them [iv]. Social resources: Support Workshop group (participants and trainers/facilitators) provides a supportive environment and concrete assistance with creating one’s digital story. Support provided by the workshop is available only for a limited time, and continued community support depends on collaboration with local partners. DST has no impacts on macro-level social structures and institutional support. Table 1. Strenghts and and limitations of Digital Storytelling in relation to access to ICT and digital media. I am grateful to the RLabs Iringa team for making conducting this Digital Storytelling workshop and the related study possible. I’d like to give special thanks to the coordinator of RLabs Iringa, Yusuf Ssessanga, and to Sanna Nevala, RLabs volunteer at the time, for the invaluable input in planning and organizing this workshop. In addition, I want to thank Johanna Ylinen, Anni Pajari, Jenny Mäkinen and Ninni Heinonen for contributing to the practical implementation of the workshop, and GROW Leadership Academy students for the inspiring workshop experience and for their willingness to share their experiences in this study. Group interview 1 with Grow Leadership Academy students, conducted and recorded 7.5.2014 at RLabs Iringa, Iringa, Tanzania. Group interview 2 with Grow Leadership Academy students, conducted and recorded 7.5.2014 at RLabs Iringa, Iringa, Tanzania. Bandura, Albert. 1994. ”Self-efficacy.” In Encyclopedia of Human Behavior, Vol 4., edited by Vilayanur S. Ramachaudran, 71–81. New York: Academic Press. Brushwood Rose, Cloë. 2009. ”The (Im)possibilities of Self Representation: Exploring the Limits of Storytelling in the Digital Stories of Women and Girls.” Changing English 16:2, 211–220. Carpentier, Nico. 2009. ”Digital Storytelling in Belgium: Power and Participation.” In Story Circle. Digital Storytelling around the World, edited by John Hartley, and Kelly McWilliam, 188–204. Malden, MA & Oxford: Wiley-Blackwell. Couldry, Nick. 2008. “Digital Storytelling, Media Research and Democracy: Conceptual Choices and Alternative Futures.” In Digital Storytelling, Mediatized Stories. Self-representations in New Media, edited by Knut Lundby, 41–60. New York: Peter Lang. Czarnecki, Kelly. 2009. ”How Digital Storytelling Builds 21st Century Skills.” In Digital Storytelling in Practice by Czarnecki, Kelly. Library Technology Reports 7 (October 2009), 15–19. DiMaggio, Paul J., and Eszter Hargettai. 2001. From the ”Digital Divide” to “Digital Inequality”: Studying Internet Use as Penetration Increases. Working paper 15. Princeton N.J.: Centre for Arts and Cultural Policy Studies, Princeton University. Dush, Lisa. 2009. ”Digital Storytelling in Organizations: Syntax and Skills.” In Story Circle. Digital Storytelling around the World, edited by John Hartley, and KellyMcWilliam, 260–268. Malden, MA & Oxford: Wiley-Blackwell. Etta, Florence, and Laurent Elder (eds.). 2005. At the Crossroads: ICT Policy Making in East Africa. Nairobi: East African Educational Publishers Ltd.
Hartley, John, and Kelly McWilliam. 2009. ”Computation Power meets Human Contact.” In Story Circle. Digital Storytelling around the World, edited by John Hartley, and Kelly McWilliam, 3–15. Malden, MA & Oxford: Wiley-Blackwell. Heikkinen, Hannu L.T., and Jyrki Jyrkämä. 1999. ”Mitä on toimintatutkimus?” In Siinä tutkija, missä tekijä. Toimintatutkimuksen perusteita ja näköaloja, edited by Hannu L.T. Heikkinen, Rauno Huttunen, and Pentti Moilanen, 25–62. Jyväskylä: PS-Kustannus. Herzberg Kaare, Birgitte, and Knut Lundby. 2008. ”Mediatized lives: Autobiography and assumed authenticity in Digital storytelling.” In Digital Storytelling, Mediatized Stories. Self-representations in New Media, edited by Knut Lundby, 105–122. New York: Peter Lang. Hill, Amy. 2004. ”Participatory Media Help Ugandan Women Who Have Experienced Obstetric Fistula Tell Their Stories.”Communication for Social Change, MAZI Articles. Katz, James E., and Ronald E. Rice. 2002. Social Consequences of Internet Use. Access, Involvement, and Interaction. Cambridge, MA: MIT Press. Lambert, Joe. 2009a. Digital Storytelling: Capturing Lives, Creating Community. 3rd ed. Berkley, CA: Digital Diner Press. Lambert, Joe. 2009b. Digital Storytelling Cookbook. Berkeley, CA: Center for Digital Storytelling. Lambert, Joe 2009c. ”Where it all Started. The Center for Digital Storytelling in California.” In Story Circle. Digital Storytelling around the World, edited by John Hartley, and Kelly McWilliam, 79–90. Malden, MA & Oxford: Wiley-Blackwell. Li, Ledong. 2007. ”Digital Storytelling: Bridging Traditional and Digital Literacies.” In Proceedings of E-Learn: World Conference on E-Learning in Corporate, Government, Healthcare, and Higher Education 2007, edited by T. Bastiaens, and S. Carliner , 6201–6206. Chesapeake, VA: Association for the Advancement of Computing in Education (AACE). Lundby, Knut. 2009. ”The Matrices of Digital Storytelling: Examples from Scandinavia.” In Story Circle. Digital Storytelling around the World, edited by John Hartley, and Kelly McWilliam, 176–287. Malden, MA & Oxford: Wiley-Blackwell. Lundby, Knut. 2008. ”Introduction: Digital Storytelling, Mediatized Stories.” In Digital Storytelling, Mediatized Stories. Self-representations in New Media, edited by Knut Lundby, 1–17. New York: Peter Lang. McWilliam, Kelly 2009. ”The Global Diffusion of a Community Media Practice: Digital Storytelling Online”. In Story Circle. Digital Storytelling around the World, edited by John Hartley, and Kelly McWilliam, 37–75. Malden, MA & Oxford: Wiley-Blackwell. Mossberger, Karen, Caroline J. Tolbert, and Ramona S. McNeal. 2008. Digital Citizenship. The Internet, Society, and Participation. Cambridge, MA: MIT Press. Nyboe, Lotte, and Kirsten Drotner.2008. ”Identity, Aesthetics, and Digital Narration.” In Digital Storytelling, Mediatized Stories. Self-representations in New Media, edited by Knut Lundby, 161–176. New York: Peter Lang. Reed, Amber, and Hill, Amy. 2010. ”Don’t Keep It To Yourself!’ Digital Storytelling with South African Youth.” Seminar.net – International journal of media, technology and lifelong learning 6(2). RLabs. 2014. Grow Leadership Academy. Robin, Bernard R. 2008. ”Digital Storytelling: A Powerful Technology Tool for the 21st Century Classroom.” Theory Into Practice 47:220–228. Smeda, Najat, Eva Dakich, and Nalin Sharda. 2014. The Effectiveness of Digital Storytelling in the Classrooms: a Comprehensive Study. Smart Learning Environments 1(6). DOI 10.1186/s40561-014-0006-3. Thumim, Nancy. 2009. ”Exploring Self-representations in Wales and London: Tension in the Text.” In Story Circle. Digital Storytelling around the World, edited by John Hartley, and Kelly McWilliam,205–217. Malden, MA & Oxford: Wiley-Blackwell. Thumim, Nancy. 2008. ” ‘It’s Good for Them to Know My Story’: Cultural Mediation as Tension.” In Digital Storytelling, Mediatized Stories. Self-representations in New Media, edited by Knut Lundby, 85–104. New York: Peter Lang. Van Dijk, Jan A. G. M. 2005. The Deepening Divide: Inequality in the Information Society. London: SAGE. Warschauer, Mark. 2004. Technology and Social Inclusion. Rethinking the Digital Divide. Cambridge, MA: The MIT Press. Wexler, Lisa, Aline Gubrium, Megan Griffin, and Gloria DiFulvio. 2013. ”Promoting Positive Youth Development and Highlighting Reasons for Living in Northwest Alaska through Digital Storytelling.” Health Promotion Practice 14(4):617–623. DOI: 10.1177/1524839912462390. [i] GROW Leadership Academy (GLA) programme of RLabs Iringa is a six months long training programme targeted at young adults who are no longer in school nor at work, with the aim of empowering participants to employ themselves and to contribute positively to the local community through social entrepreneurship (RLabs 2014). [ii] Our Digital Storytelling curriculum was rather different from the “classic” DST workshop model, in which the work usually continues for 2–5 consecutive days. As our sessions took place in the course of five weeks, it might be justifiable to talk about DST training or a DST course, rather than a workshop. However, I prefer using the term ‘workshop’, as, in spite of the longer duration and shorter sessions, our DST implementation was very much based on hands-on learning, collaboration, sharing, and an intensive, facilitated group process – all essential characteristic of a DST workshop. [iii] Since at the time of the workshop, RLabs Iringa’s laptops used the Linux-based operating system Ubuntu, we chose a free open source software developed for Ubuntu, called OpenShot. Other free or low-cost options are available for computers with other operating systems, and there are also video editing applications for mobile devices. [iv] For discussion of different types of skills, competences and literacies related to ICT and digital media, see e.g. Gutiérrez and Tyner (2011), Helsper and Eynon (2013), Livingstone (2004).